As we gathered for our Thanksgiving dinner, I was asked, "how do you determine what wine is best to pair with the meal? "...The easy answer is that is takes a lot of trial and error, but in reality, there are certain things I take into consideration when trying to find the best wine for the meal. Let me first say that food and wine pairing should not be something that you agonize over. Everyone's tastes and preferences are different. To start, I think it is very important to know the common flavor/aroma profiles for at least the most common wine grapes. For example, Sauvignon Blanc is known for its' high acidity. It is light to medium in body. When I taste Sauvignon Blanc, I always get a bit of vegetal character, similar to green grass, green beans or asparagus. I find this character stronger in wines that come from cooler regions, where the grapes may not have had time to ripen completely. The riper (or warmer region) Sauvignon Blancs pick up more tropical aromas (grapefruit, honeydew, passion fruit), but still have that tell-tale vegetal streak. Knowing this will help you to pair, as you will see later in this blog series. Knowing the common flavor profiles of the wines listed above, will help you to find similar wines from different regions that might also be fun to try. So, next time you are looking for a wine to pair with you meal, start with the regionality of the dish. In the next blog, we'll look at weight of the meal, balancing the meal with the wine, and some of the "tricky" foods to pair. Feel free to share some of your favorite "classic" pairings. With Thanksgiving only a couple days away, I have been getting a lot of questions about what wines to pair with the Thanksgiving dinner. I've got to say that this is one of the most difficult meals to pair, as everyone does something different and there are so many things going on. I would venture to guess that most people have the traditional Turkey, but beyond that, it is a virtual cornucopia of different side dishes, and desserts. So how do you pair with them all? The approach I take is to look at the whole meal. What are your predominant flavors, and weight of the meal. Are you going heavy on the spice, sweet, or vegetables? Here are my thoughts....You can never go wrong with a sparkling wine. I like the acidity and refreshing sparkle to cleanse the palate. I find that a Blanc de Noir (white of reds) has a little more flavor profile. If you are a white wine drinker, I like Viognier with Thanksgiving dinner. It has some nice acidity to it, and adds some floral aromas that seem to pair well with many of the side dishes that accompany the typical dinner. If you are not familiar with Viognier...this is a classic grape from the Rhone region of France, but you can find many wineries in California that are producing wonderful versions. If you are a bit more daring, try an Italian Falanghina, or a Spanish Albarino, or even a dry Riesling from Alsace (the only dry Rieslings that I have found in California are Clairborne and Churchill, out of the Edna Valley - very nice, but a bit hard to find). For the Red Wine drinkers. Stay away from the high tannin, heavy wines, and go a bit lighter and fruitier. I like a nice Pinot Noir (particularly from Oregon, which I find have a bit more earthy character, which works well with food), or a fruity/spicy Zinfandel. Even the odd Beaujolais Nouveau works with Thanksgiving dinner, but it is a taste you will need to get used to. If you can't decide between red or white (you should probably have both anyway), why not a nice rose? I find that when I mention rose, most people immediately think of White Zinfandel. There really are some very nice roses on the market. If you can find Tavel or Bandol (from France) give them a try. They are are little hard to find this time of year, but are worth the search. I have also found some nice roses coming out of the California central coast (try Dragonette Cellars). Lastly...Dessert. Always remember to have a dessert wine that is sweeter than the dessert you are serving. Tawny Port, Madiera, PX Sherry...all make nice additions. Try the PX with apple pie...YUM! Hopefully this will give you a few ideas. Pairing sometimes gets too darn serious....so have fun, and experiment. Please share your pairing experiments here, and we can all add some ideas to our list! Today is the third Thursday in November, and for those of you who follow wine, you know that this is the day Beaujolais Nouveau is released. So it begs the question...what is this Nouveau stuff? Let's start with where it comes from...France. But more specifically, the Burgundy Region. "But Jim, Burgundy makes super expensive, wonderful Pinot Noir based wines (and Chardonnays), but this doesn't taste anything like those." There is another red grape in Burgundy, and that is Gamay (grown only in the southern section of the Burgundy region, in, of all places Beaujolais). The Beaujolais region is made up of ten main villages: St Amour, Julienas, Chenas, Moulin-a-vent, Fleurie, Chiroubles, Morgon, Regnie, Brouilly, and Cote de Brouilly. So what is so special about Beaujolais Nouveau? Well, it is the first wine released from the most recent vintage. That is, the wine is only about six to nine weeks off the vine. It doesn't go through the "normal" fermentation, but goes through a process known as carbonic maceration. This is a process in which the grapes are not crushed, but are kept in whole bunches, in an anaerobic atmosphere. The weight of the grapes crush the lower grapes, and natural fermentation begins, creating carbon dioxide. This permeates the uncrushed grapes, and causes them to ferment from within. This process leads to simple, vibrant, fruity/grapey wines. they are meant to be drunk young, as a celebration of the harvest. I find that these types of wines work well with cheese (particularly goat cheese) meat, stews, charcuterie, salmon, turkey (Thanksgiving idea). I went looking for the new releases today, and was disappointed to find that only one label was in all three wine stores I went to (and probably in your local grocery store)...George Debouf. When I tried this label last year, I found it overly "cherry cola and bananas" tasting, so decided to stay away this year. I'm holding out for the Drouhin release. I've always liked their wines. Now that we have moved our website to http://www.arrowheadwineclub.com/, it was suggested that I use this site to start an actual wine blog. Bear with me, as I am new to this entire process. The Arrowhead Wine Enthusiasts, grew out of the need for a new approach to learning about wine in a fun social manner. The original club started out at the Lake Gregory Wine Club, well before I moved up to Lake Arrowhead. At that time, Joe Herpin was the president of the club, and was also a distributor with Young's Market. All the wines were from his portfolio. When Joe stepped down as President, I took over that original club. Wine had been a hobby for me, and I loved learning about new wines, and how they paired with food. My approach was to keep the club open for new members and try new and different wines. As the club grew, it became apparent that there were differences of opinion on how the club should move forward. Some wanted to keep it a small club and taste wines that they could easily buy in the grocery store, and others wanted to keep it open to anyone that would like to attend, and try different wines/varietals from around the world. I think it was around 2006, that we decided to split the club in two, and the Arrowhead Wine Enthusiasts (AWE) was formed. As someone who liked to learn about wine I decided it would be a good idea for me to learn more, and then I could share that information with the rest of our club. In 2008, I explored all the different educational options to learn about wine, and chose what I thought was the most extensive program: The International Sommelier Guild (ISG). I completed level I and Level II with the ISG in the Spring of 2009. I loved what I could share with the rest of our club, and took many of my classroom experiences to the club. The next step was a big one...going for full certification as a Sommelier, and completing the Level III diploma course. The course consisted of 26 weeks of instruction, 9 hours each course, and that didn't include the 3 hour drive (each way) to attend the course, or the 2 - 3 hours of reading, and homework projects every night. Needless to say, this was a lot of information to absorb. During the course, I was given a project, to develop a restaurant. I had to develop a beverage training program, inventory management system, inventory of beverages, menu, pairing menu, and full concept for the restaurant. This project was used for one of my final exams: service exam, where we served a customer, and made recommendations based on our menu, and wine list. We were required to use proper technique to serve a sparkling wine and a decanted wine. Additional course exams included: 200 Multiple Choice Questions (probably the most difficult test); 10 Essay questions; 2 Service, short answer questions; 22 Blind tastings; and 4 Pairing menus with recommendation of beverages for four to five courses on each menu, and rationale for those pairings. We were required to achieve a minimum of 70% on each of the exams. If any one of these was below 70%, then we would have to retake the exam at a later date. The wait, for results, was painstaking, as it took three months to learn our results. Out of the 12 people that started the diploma course, only five of us passed the exams. Last night, we officially received our diplomas, and Sommelier pins. Now I am continuing the education. As was pointed, out, wine has dramatic changes at least two times a year, when the new vintages from the northern and southern hemisphere are released. There is so much to learn, and the only way to do it is to continue to explore. I recently took the WSET (Wine & Spirits Educational Trust), level II exam, and passed that with no problems, Next year, I'll be taking the level III course/exam, when offered. I am also trying to get a small study group together for the Society of Wine Educators course. This is a self study group, that allows you to take the exam when you are ready. Well that's it for my first wine blog for the Lake Arrowhead Wine club, better known as the Arrowhead Wine Enthusiasts. Send me your ideas on what you'd like me to discuss, and I will do my best to contribute. This blog will now be the archive for Jim's tasting notes from our meetings. What you tried tonight was a blind tasting of 6 wines, the first three white of the same grape varietal, and the last three red of the same grape varietal. The whites were all Sauvignon Blanc. How can we tell? First, we checked the body of the wine. It had a lighter body, so we could eliminate Chardonnay as an option. Second, we checked the acidity level. The was was high in acid, so it could be either Riesling or Sauvignon Blanc, but the wine did not have the petrol/vinyl quality typically found in Riesling. That leaves Sauvignon Blanc. All three of these samples had a taste theme -- vegetal, which is traditional in this varietal. "Sauvignon" is French for "wild." Touraine from the Loire Valley in France, lwhich is lower in alcohol, less fruity, and tasting more of minerals and the terroir where it grew. Now we moved to the reds. Wines 4 through 6 were all the Syrah varietal. How can we tell? It's a dark, heavy wine, so we can eliminate Pinot Noir. But it's not very tannic, so we can eliminate Cabernet Sauvignon and Merlot. That leaves us with Syrah and Zinfandel. The theme running through these wines is black pepper, leather, and meat, all of which is typical of Syrah. 5. A Crozes-Hermitage from the Northern Rhone in France. Northern Rhone wines are 100% Syrah, while Southern Rhone wines are a blend of Syrah, Grenache, and Mouvedre. These wines are usually very expensive. 6. A Melville Syrah from Santa Barbara. Typically New World wines are higher in alcohol than Old World wines, while Old World wines are more food-friendly. Thank you to the Bodtke family for hosting tonight's meeting. Next month is our planning meeting. We will meet at the home of Bruce and Kathleen Field. Please BYOB and a dish to eat. 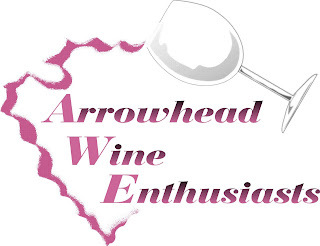 The Arrowhead Wine Enthusiasts logo is a registered Trademark with Jim Newcomb and used with permission.